On 24 August 79 AD Mount Vesuvius began to erupt, throwing volcanic ash many kilometres up into the sky. As the wind blew the ash in a south easterly direction, it fell on Roman settlements that lay to the south east of Vesuvius. The most well known of these is of course the city of Pompeii, but the towns of Oplontis, Stabiae and Boscoreale were also covered by as much as two metres of tephra ash. Sometime later as the first of the pyroclastic material flowed down the side of the volcano, settlements not initially affected by falling ash were buried under a liquid mixture of ash and gases. Herculaneum, which lay to the west of Vesuvius, was covered under some 20 metres of volcanic matter. These sites have attracted tourists for centuries, just under three million people visit Pompeii each year. The following tips are provided to help you work out the best ticket options for your visit to these spectacular archaeological sites. The Special Superintendency for the Archaeological Heritage of Naples and Pompeii is the semi-autonomous body charged with the research, conservation and management of these iconic Vesuvian archaeology sites. 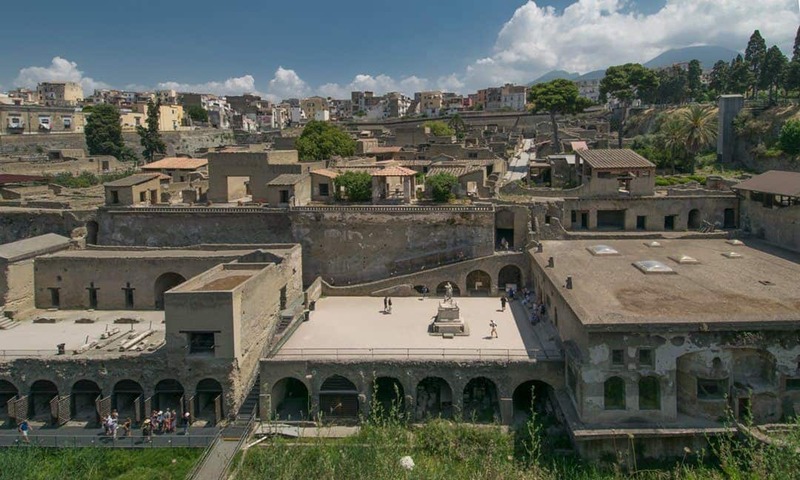 Five of them, the ancient towns of Pompeii and Herculaneum, and the villas at Oplontis (Villa Poppaea), Boscoreale (Villa Regina) and Stabiae (Villas of San Marco and Arianna), are open to the public. All of these sites are within easy reach of each other, and it is possible to see them all in two or three days. There are a few ticket options that can save visitors both time and money. The first option is to purchase tickets for each site, as and when you visit them. Doing it this way is good for people staying for several days in the area and wanting to spread out their visits. Another option that saves both time and money is to buy a combined ticket for Pompeii and Herculaneum that also includes all the villas. This option is particularly useful for those wishing to visit all of the sites, and can do so in three consecutive days (it is possible). Entry to the Stabiae villas is free, but the cumulative cost for individual, separate entry to the other four sites is €29.50 for adults. 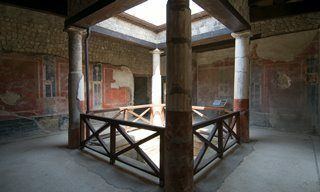 A combined ticket for Pompeii, Herculaneum, Oplontis and Boscoreale costs €22.00 for an adult, and is valid for one entry to each site over a period of three consecutive days. Not only do you save a few Euros, but having the combined ticket does save time having to queue for tickets at each site. 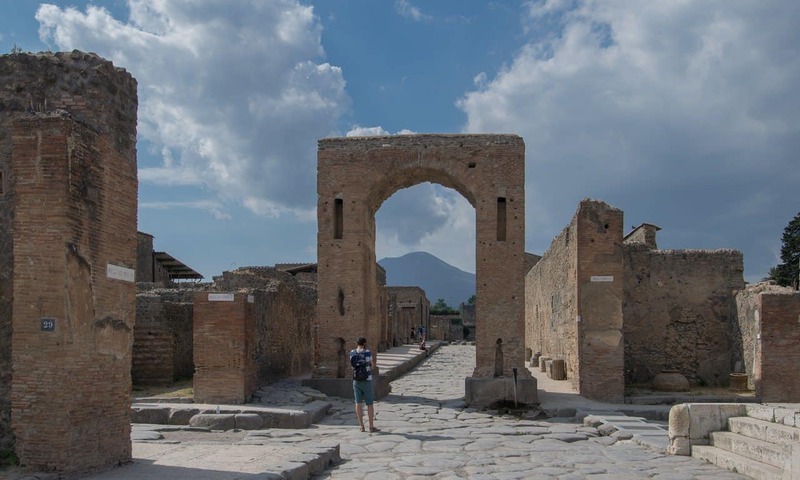 For those of you who like to have your tickets purchased and ready before you travel, it is possible to purchase separate tickets for entry to Pompeii and/or Herculaneum online, in advance. Also, you can buy a Circuito archeologico vesuviano (Vesuvian Archaeological Circuit) – a ticket that gets you in to Pompeii, Oplontis and Boscoreale. This ticket does not include Herculaneum. The disadvantage to these buying these tickets online in advance is tat you have to decide the day on which you will visit. For some people this is not an issue, for others it is. If like me you do not plan each and every day in advance where possible, or your plans are likely to change and you prefer to retain some degree of flexibility, this is probably not an option for you. Click Here to Buy Your Tickets Online. Unfortunately, at this stage it is not possible to buy the 22€ combined ticket online, which includes Pompeii, Herculaneum, Oplontis and Bscoreale (the two Stabiae villas are free of charge to enter). 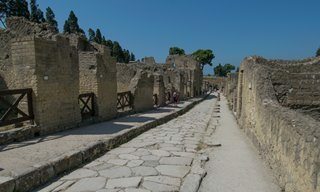 Although Pompeii and Herculaneum are popular sites, attracting thousands of visitors daily at the busiest times of the year, I am not convinced that it is such a terrible thing not to be able to purchase the combined tickets in advance. And I am not sure I would buy in advance specific entry tickets for Pompeii and/or Herculaneum either. I visited in June, and over a period of three days the queues moved very quickly. I saw two buses arrive at the Porta Marina (the main entrance to Pompeii) at once. Seeing the people who got off all headed for the ticket office, and then buying tickets individually, I decided to watch and time the queues. Twenty-two minutes later and it was all over; they had purchased a ticket and were through the entrance turnstiles and on their way into the archaeological site of Pompeii. There is no entry fee on the first Sunday of each month. Otherwise, be careful to buy your tickets at the official ticket offices, not the various places that claim to be the ticket that are located just outside the sites. For example, the ‘ticket office’ in the station is not the official office for Pompeii, but will try and sell you all sorts of day trips and bus tours. It is telling that the website of the Special Superintendency for the Archaeological Heritage of Naples and Pompeii makes the following warning: We kindly point out that the official ticket offices are only inside the Park, all sellers outside the main entrances are in no way linked to the business of the Pompeii Archaeological Park. 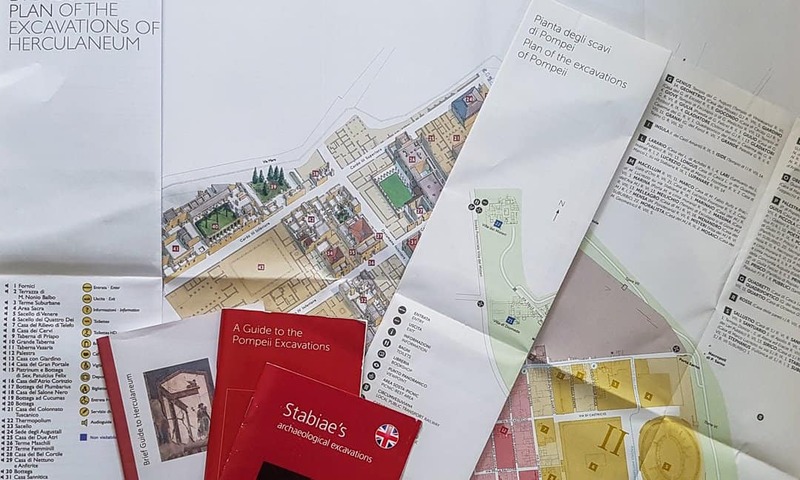 Essential items for anyone tackling these sites on their own: free guides and maps are provided at the entrances. Outside the entrances you will encounter tour guides offering their services. 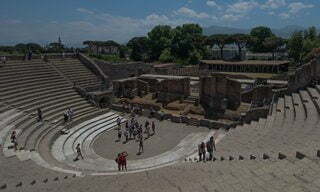 For €60 for a group of six you can get a two hour guided tour of Pompeii. These are good for visitors who have a limited amount of time to see the site, and want to see the highlights or have a list of features to see but do not want to waste time reading maps, getting yourselves oriented and finding them. Be sure to get a guide who is certified by the Region of Campania, identifiable through official badges. It is also possible to book a guided tour or a day trip through the Get Your Guide network of local guides. These are certified sellers and more often than not offer tours and activities that are cheaper than can be found on the day, on the street as it were. Below, for each site are recommended guided tours and day trips of the sites around Vesuvius, including the volcano itself. Please note: it is standard practice for the cost of the entrance tickets not to be included in the cost of the guided tour. There are a number of reasons for this, but one that favours the visitor is that you could very well be eligible for reduced entry price. As there is not one entrance fee that covers everyone it would be unfair of the tour guides to charge as if this were the case. But when choosing a day tour or a walking tour of any of these sites, and in general really, read carefully what is included and what is excluded in the cost. Pompeii exceeded all my expectations. Having spent most of one day on the site, I could happily return for another visit. And one day I will. I can understand why some people feel the site is overwhelming, I was overwhelmed by the sheer extent of the site. For this reason excellent guidebooks and maps are provided free of charge for visitors. These can be picked up at the entrances. They offer various itineraries of the site, based on the time you have available (two hours, half a day, full day) or your interest (eg. daily life, art, etc.). It is possible to exit for lunch and return, get a wrist band at the entrance/exit near the amphitheatre – but you must re-enter here too. Where Pompeii is vast, Herculaneum is much more compact, but no less impressive. In fact, many people who have visited both have told me that they greatly preferred Herculaneum to Pompeii. Indeed they are very different sites, because of their archaeological history and because they were affected by the erupting volcano in different ways. And in their differing ways they are both equally spectacular. If it is possible, visit both! Because Herculaneum is so small, in my experience tour groups stand out more. So visit as early or as late in the day as you can when the site is much quieter. And as at Pompeii, excellent maps and guides of the site are provided free of charge at the entrance. Walking down the ramp to the excavated villa, you could be forgiven for thinking this is just another building once covered in ash. Once you enter and start exploring the buildings the secrets are revealed and you begin to appreciate just what a magnificent villa this once was. Located in the middle of the modern day town of Torre Annunziata, this grand residential building was originally constructed in the mid-1st century BC and occupied by an Imperial family right up until the eruption of Vesuvius. 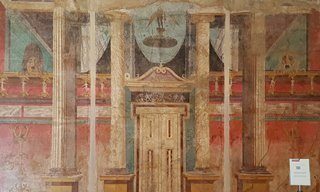 Take time to look closely at the wall paintings throughout the villa – they really are quite remarkably well preserved, and conserved for our enjoyment today. Boscoreale lies at the foot of Vesuvius. People have been attracted to the fertile soils long before the Romans. When the volcano erupted there were a number of farms growing olives, grapes and cereals, and some villas belonging to wealthy landowners. 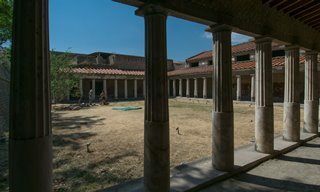 Besides a number of excavated villas in amongst the houses of modern day Boscoreale, there is also the Antiquarium, a museum focusing on ancient food and daily life with artefacts recovered from Pompeii and Herculaneum, and the villas of Boscoreale, and Oplontis and Stabiae. Next to the museum is Villa Regina, the only fully excavated and reconstructed villa in the area. Stabiae was a Roman town southwest of Pompeii. Two residential buildings, Villa San Marco an Villa Arianna, have been excavated. They are a bit further out than the other sites. And the entrances are a bit further away from the train station. So a taxi or a walk is necessary, or get a guide to take you. But a visit to these two villas is well worth the extra effort, even on a hot day (Getting to Stabiae By Train). You may find you are the only person visiting, or if there are other people the sites are so big you will not be bumping into them that often. From the Villa San Marco there is a spectacular view across the Bay of Naples towards Naples with a very prominent Vesuvius on the right. Is Seeing all Five Sites in Three Days Possible? There is no doubt, the combined Pompeii, Herculaneum and Vesuvian Villas ticket is worth it, even if you only visit Pompeii and Herculaneum (€22 as opposed to €24). Besides saving a few Euros, you certainly save some time too. The combined ticket allows holders one entry per site over a period of three consecutive days. 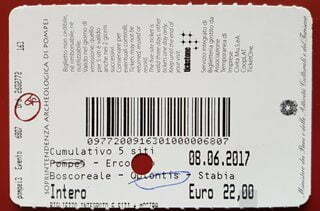 The photograph of the ticket (above) shows how each site gets marked off on entry. In my opinion, three days is easily enough time for most people to visit all three sites – at a push, and during summer with longer hours, two days would be adequate for a lot of people. All but the Stabiae villas are quite close to each other, only taking a short train ride on the Circumvesuviana line. Even thought the train station for Stabiae is a bit further out and then getting to the sites requires a short taxi ride or a 25 minute walk, I managed to include these villas within my three days I had available for the Vesuvian sites. Also bear in mind entry to these two villas is free and so does not have to be done within the time limit of the combined ticket. I spent the better part of Day One at Pompeii. I stayed in a hotel next to the site, which meant I did not have long to walk after my long, hot June day. I was also close to the Pompeii station for me to get an early start to Herculaneum and Villa Oplontis on Day Two. On Day Three I visited the Stabiae villas in the morning and Boscoreale in the afternoon. With the Vesuvian sites done, on the fourth day I headed into Naples to get a train to Paestum. The archaeological site of Herculaneum, with Mount Vesuvius in the background. NextStabiae, Off the Beaten Track But Worth It!